Essence imported from France. Blended in the USA. Post shaving products run the gamut from creams and lotions to gels and balms but the brisk feel of a slightly fragranced liquid is still preferred as a finish to the shaving process. Cools…exhilarates. Soothes tender skin. Helps heal razor nicks. Suave, masculine fragrance. After every shower, bath or swim, shake on this pure white neutral scented talc. Micro-pulverizing process makes this talc super soft-extra smooth and soothing. a zesty fougere fragrance with a top note of lime. The floral middle note of Clubman Pinaud Lime Sec is blended with musk and exotic woods. 12.5 fluid ounces, plastic bottle. 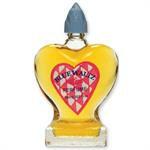 A sweet and spicy perfume, made popular in the 1950's. Each glass bottle contains 5/8 ounce of this old time favorite.